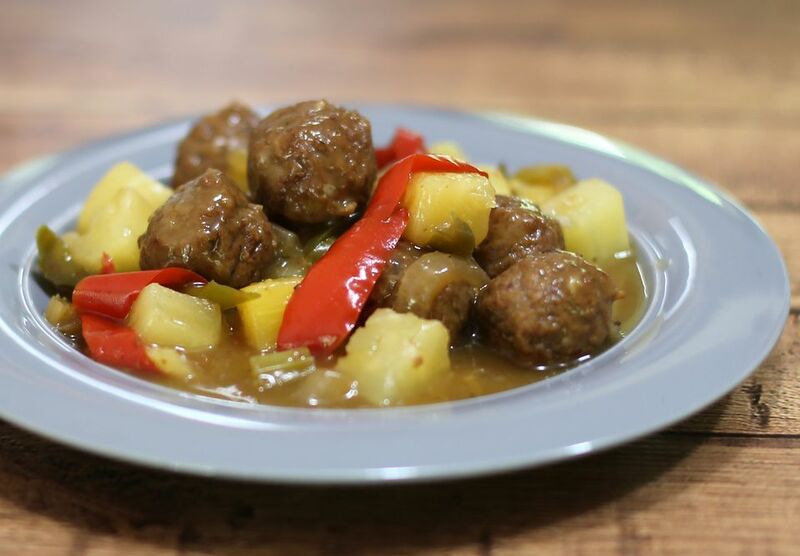 The tangy sauce for these sweet and sour meatballs is flavored with pineapple, bell pepper strips, and celery. Serve the meatballs with rice and steamed broccoli, green beans, or carrots. In large mixing bowl, combine bread crumbs with minced onion, salt, pepper, and 1/2 cup water. Add ground beef and egg. Shape beef mixture into 16 meatballs. Brown the meatballs slowly in a large skillet over medium-low heat. When the meatballs are browned and cooked through, remove from the skillet and set aside. Cook celery and pepper strips in skillet for about 5 minutes. Add remaining water, vinegar, brown sugar, and soy sauce. Mix cornstarch with a little cold water then add to skillet; stir well and cook for about 4 minutes. Add meatballs and pineapple. Cook until heated through. Serve with hot cooked rice or noodles, along with steamed broccoli or green beans. Meatballs may also be baked. Heat oven to 350 F. Line a large rimmed baking sheet or roasting pan with foil and place cake cooling rack in the pan. Arrange the meatballs on the rack and bake for 35 to 40 minutes, until cooked through and nicely browned.